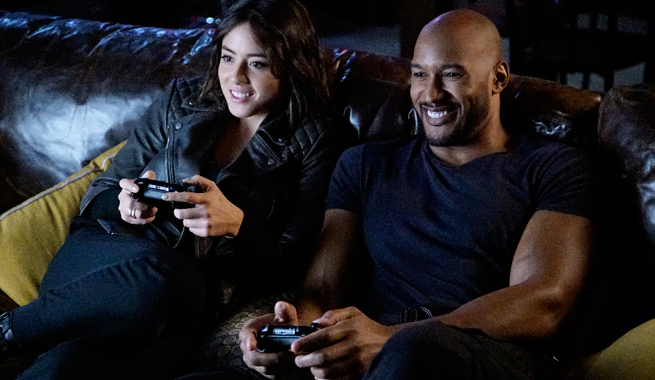 Agents of SHIELD returned this week with out agents finding themselves in a very familiar situation – and that’s not necessarily a good thing. After a half season of the Team freaking out over Inhumans, it seems repetitive at best that now we’re dealing with the world fearing Inhuman people. This of course will all pay off in the end; but until that time comes, AoS has lowered the heat to a slow and steady boil. So let’s take a look back at “A Wanted (Inhu)man” and see what worked and what left us wanting more. Last season we saw how Lincoln taught Daisy that she isn’t a monster and how her gifts can be a blessing. So with Afterlife gone, it makes sense that Lincoln’s faith in everything he grew up with would fall as well. This offers the potential for Daisy to return the favor and teach Lincoln his great his powers are. This idea also rings true for Fitz and Simmons. Last Season we saw how Simmons tried to help Fitz through his trouble, and now we see Fitz doing the same for Simmons. Hopefully Fitz will fair much better than Simmons did, but he is already learning how difficult it can be when someone returns “different”. Whether Simmon’s desire to return hints at unfinished business or just how much she has changed remains to be seen. Either way, these role reversals and slowly blossoming relationships were definitely the highlight of the episode. Betrayal was very common this episode. Not only did Hunter have to fight the Hydra contact he once thought was a friend; but Lincoln and Daisy has some betrayals to deal with as well. Though the strangest thing about all of them, they all seemed very poorly set up. Hunter and Lincoln both had to deal with someone whom they seemingly had a strong relationship with betraying them; and yet neither were set up properly. The Hunter one makes sense since they were just old buddies; but the level of focus on Hunter’s refusal to fight him was a little more than was set up for. As for Lincoln, we heard how his friend had saved his life many times before and from the looks of it even helped Lincoln when he first discovered his powers. So why the sudden betrayal? Though the worst betrayal moment had to go to Coulson – and I hate to have to say that. Having Coulson trade Lincoln for Daisy made far too little sense. Yes he of course wants to protect Daisy but he kind of gave up his hand way too fast. Circulating Daisy’s photo wouldn’t have caused that much of a problem since Daisy is with SHIELD and isn’t just roaming about in the world. Further more, the trade plan failed and Coulson had to then offer ‘partnership’. Why couldn’t Coulson have offered that while Lincoln was ready to come in? This was a very poorly constructed moment and honestly I’m a little disappointed with how this turned out. Yes Coulson is tired of fighting potential allies; but he couldn’t remember that right before he lost a potential ally? I’m sure this is probably going to lead to a possible Lincoln team up with Lash; but if that was the writers intent then I still say there were better ways to go about it. Since Lash is supposed to appear next week and his plans/motivations revealed, hopefully it’ll make up for it. Though with shows like The Flash and Arrow bringing a very strong and sustained effort this season, Agents of SHIELD needs to change things up a bit. Rather than each episode standing on its own while also pushing a building theme, each episode has become a puzzle piece completely dependent on everything that’s come before and after it. If this continues, AoS might return to being the show you marathon right before the Midseason/Season finale – rather than the show you watch each week to only move one tiny step forward. October 14, 2015 in Marvel's Agents Of S.H.I.E.L.D.. Tags: ABC, Agents of S.H.I.E.L.D., Agents of Shield, Marvel’s Agents of S.H.I.E.L.D.